Girl Scout Troop 7121 Brings Christmas Spirit to Seniors! 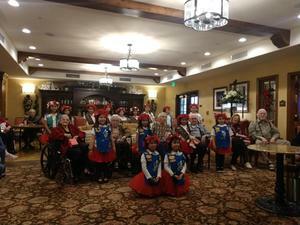 Once again our Girl Scout Troop 7121 spread Christmas cheer in the San Gabriel Valley at several assisted living facilities and other community events. Over 250 pairs of socks were delivered to residents of these assisted living facilities along with caroling and performances. The girls also performed at a San Gabriel Women's Foundation event. These wonderful young ladies are a great example of how Mission Elementary Spartan's serve their community! Our junior high students created some pretty original Christmas cards this season in STEM class. Using basic materials, they were able to take home some "light up" Christmas cheer! 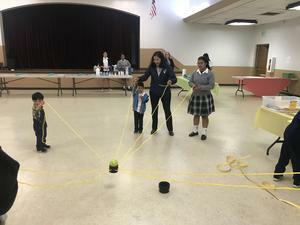 Mission Elementary is a special place where our students have learned about the pillars of Dominican spirituality that St. Dominic represented: prayer, community, study and service. A new award was presented this year at our First Trimester Awards Ceremony. 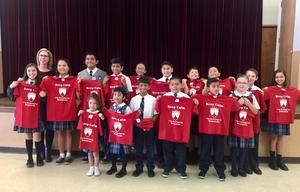 In addition to the academic and spirit awards, the Growing Up Dominican Award t-shirt was given to students in each grade who have exemplified the Dominican Pillar of PRAYER and modeled them for their peers. We are so proud of each of them! Great job Spartans! Preparing Our Hearts for Jesus! ChessMates comes to Mission Elementary! Mission students now have the opportunity to learn the exciting game of strategy that is Chess! We are most excited to add ChessMates as an extracurricular activity for our students. The renovation of our Spartan Library is complete thanks to the major efforts of Mrs.
Echeverria and her team of volunteers. The efforts include newly decorated walls, reading areas, a digital library card system and individualized library cards for the students. We are most grateful to our parent volunteers for this much needed renovation and for all the love and care that was put into the efforts. 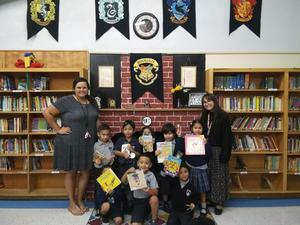 Now the students have an inviting area that encourages their love of reading. 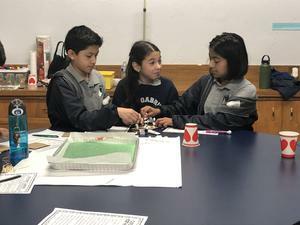 Science comes off the pages in our STEM Center! Mrs. Lopez is bringing Science to life for our students, utilizing our new NGSS-aligned, technology-rich curriculum and cool labs!